TROLLHAETTEN, Sweden (Bloomberg) -- The first vehicle from the new owners of Saab Automobile will be an electric car based on the company's 9-3. 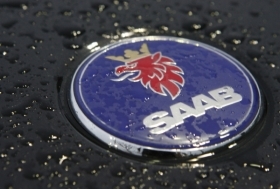 The car will go on sale early in 2014, said Saab purchaser National Electric Vehicle Sweden AB and the automaker's bankruptcy administrators Wednesday in a joint statement. The parties agreed not to disclose the transaction price for Saab. The Swedish manufacturer would be entering a market that includes the Chevrolet Volt, made by former Saab owner General Motors, and Fisker Automotive Inc.'s $103,000 Karma plug-in hybrid luxury sedan, models that have been the subject of U.S. probes following vehicle fires. "We're striving to be a world-leading company for electric cars," Mattias Bergman, a spokesman for National Electric Vehicle Sweden, said at a press conference in Trollhaettan on Wednesday. "It's not only about China being a big market for electric cars, it's also about China having the ability to make the investments required and build the needed infrastructure." NEVS consists of Hong Kong-based renewable-energy power-plant builder National Modern Energy Holdings Ltd., which owns 51 percent, and Japanese investment firm Sun Investment. Competing suitors for Saab included Jinhua, China-based Zhejiang Youngman Lotus Automobile, which was in talks since at least February and made a revised bid exceeding 4 billion crowns ($567 million) as late as June 8. Anne-Marie Pouteaux and Hans Bergqvist, Saab's bankruptcy administrators, said early in 2012 that a half-dozen parties had shown interest in buying the company. Kai Johan Jiang, founder and main owner of National Modern Energy Holdings, will become CEO of National Electric Vehicle Sweden, spokesman Bergman said on a call with reporters. Saab, which also makes the 9-5 sedan and 9-4X crossover, hasn't built cars since last year following an initial production halt in March 2011, and it filed for bankruptcy in December. Saab has been unprofitable for most of two decades, and GM, which acquired full control of the manufacturer in 2000, sold it in February 2010 to Dutch supercar maker Spyker NV. GM's Volt and Nissan Motor Co.'s electric Leaf model missed U.S. sales targets for last year. The country's National Highway Traffic Safety Administration is looking into the safety of lithium ion batteries amid instances of fires involving the Volt and the Karma. "Electric cars are a very tough business with a lot of risk," and "there's been almost no demand for them," said Ferdinand Dudenhoeffer, director of the Center for Automotive Research at the University of Duisburg-Essen, Germany. The models are 10,000 euros to 15,000 euros more expensive than equivalent gasoline-powered cars, and their restricted range also makes them less attractive, he said. Saab has hovered near bankruptcy several times, including in 1989, the year before GM bought a 50 percent stake. The U.S. company, seeking to stem losses, planned in late 2009 to shut the Swedish unit, after deciding to close the Saturn, Hummer and Pontiac divisions in the United States. In early 2010, Spyker CEO Victor Muller persuaded GM to sell the brand to him. After sales peaked at 133,000 deliveries in 2006, Saab sold just 31,700 vehicles in 2010. Deliveries were hurt that year because Saab needed longer than expected to restore production flows after GM emptied the factory and cut the brand's supplier ties, Muller said in 2011. No sales figures have been released for 2011. Eric Geers, a former Saab spokesman who now works for start-up Chinese carmaker Qoros Auto, estimated in February that the Swedish brand sold 10,000 to 15,000 vehicles last year. Saab Auto's roots date back to the 1937 establishment of aircraft manufacturer Svenska Aeroplan AB, which began making cars in 1947. The auto business was split from the aerospace operations, now called Saab AB, in the 1990s. About 3,600 people worked at Saab Auto before its bankruptcy, including 3,400 in Trollhaettan. Saab Auto's new owners have started recruitment of "key people," mainly engineers and designers, Bergman said, declining to say how big its work force will be. The investors have the long-term financing needed to meet business-plan goals, he said, declining to say when Saab Auto may break even. The Swedish government may take over Saab's spare-parts unit, which wasn't included in Wednesday's purchase and was separated in the bankruptcy process, Bo Lundgren, head of the country's debt office, said June 8. The state got the components business as collateral for backing a 2.2 billion-crown loan Saab got from the European Investment Bank that the carmaker didn't repay. Taking over the unit "is still one of our scenarios," Unni Jerndal, a debt office spokeswoman, said Wednesday by phone, declining to comment further.